Shanghai-based foodie and restaurateur Lindsey Fine (aka Veggie Mama) has been creating all sorts of delicious vegan recipes since moving to China eight years ago. You can read all about the perks of eating a plant-based diet via her blog Veggie Mama and sample recipes on this series, Cooking with Veggie Mama. In this edition, Lindsey shares her recipe for Vegan Spicy Hunan Tofu Skins. The famed Shanghai restaurant Di Shui Dong is one of the places where people celebrate birthdays, host special visitors and say hellos and goodbyes in spectacular fashion while the table is filled with dish after extraordinary dish. There is one dish in particular that people rave about -- Di Shui Dong's signature ribs. Because they're not vegan, I have never tried them. As usual, I really didn't think it was fair for everyone else to enjoy crispy flavorful ribs spiced with peppers and cumin, so I set out to make those famous Di Shui Dong ribs the only way I know how… sans meat. Hunan food is deliciously spicy, but quite different from the Sichuan spice many people have come to think of as the quintessential Chinese heat. Hunan spice is complex and at times subtle. It might not set your body on fire from its heat, but it will tingle your tongue while delicately dancing around the other flavors in the mix. One day, while I was shopping for fresh ingredients at a local wet market, I saw some beautiful rolls of golden brown tofu skins. I immediately thought they would make the best rib substitute because of the texture and their ability to soak up sauces and flavors. This recipe calls for the tofu skin rolls to be baked, but they can also be fried in a wok. If using that method, add a larger amount of cooking oil to the wok before cooking the ginger, garlic, chilies and cumin. Then add in the tofu skins and cook until crispy. 2. In a medium bowl, mix together rice vinegar, tahini or sesame paste, soy sauce, five spice and corn starch. Add in rolled tofu skin and mix well, ensuring each piece is lightly coated. 3. Heat a wok over medium-high heat and add a bit of cooking oil. When oil is hot add in ginger, garlic, red chilies, green pepper, scallions and cumin. Cook for 4-5 minutes until fragrant and browned. Reduce heat as necessary while cooking to avoid burning. 4. Remove cooked spice mixture from heat and add to the bowl of rolled tofu skin. Mix well, coating each piece. 5. Line a large baking pan with baking paper. 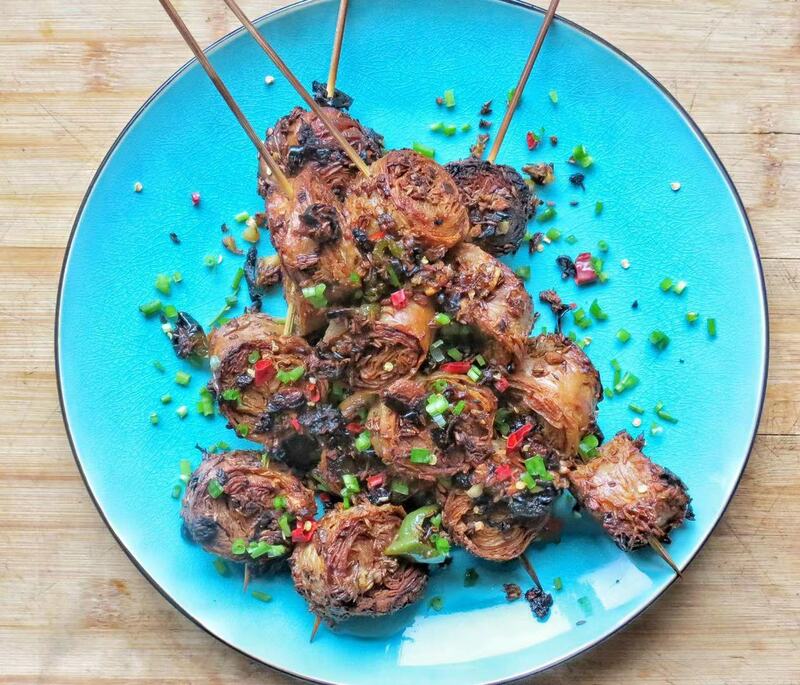 If using skewers, add 4 pieces of the rolled tofu skin to each skewer and lay on the baking pan. 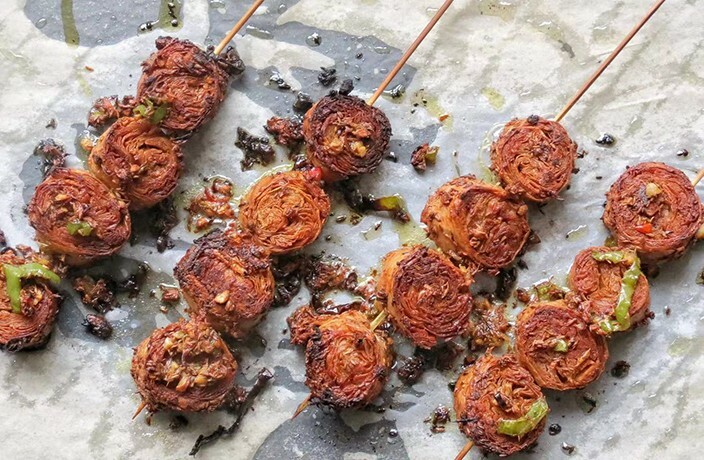 If you are not using skewers, skip this step and simply add the tofu skin rolls to the pan for baking. 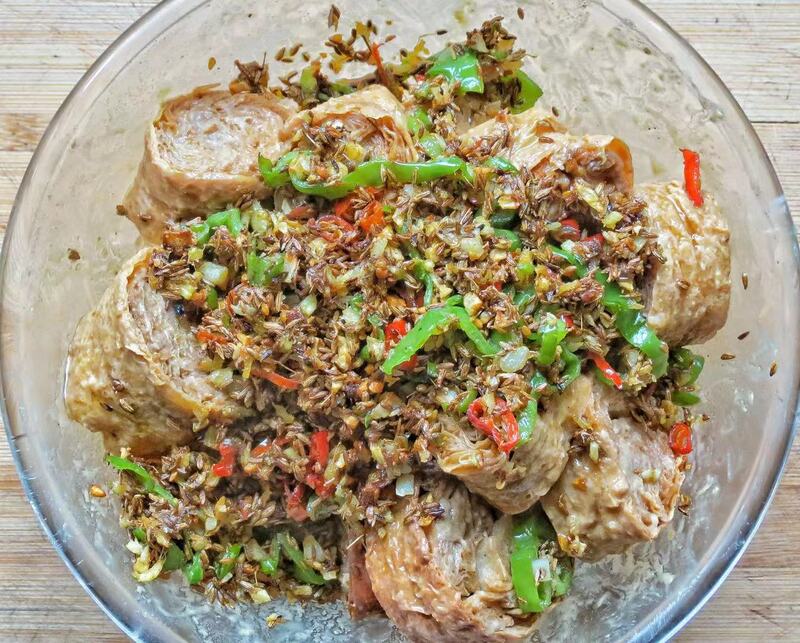 Once finished placing the rolled tofu skins on the pan, sprinkle with remaining spice mixture leftover in the bowl. 6. Place on the top rack and bake for 10 minutes, and then take out of the oven and gently flip over. Bake for an additional 5-8 minutes. You want the skins to be nice and crispy. 7. 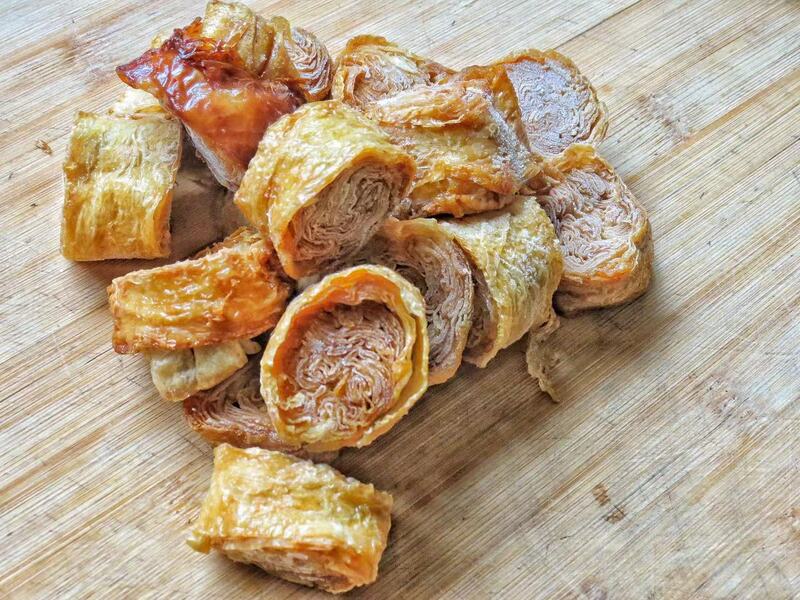 Once crispy and golden brown, remove rolled tofu skins from the oven and plate. Top with green parts of the sliced scallions and, if desired, additional fresh red chili slices. Serve immediately. This wine pairing dinner will introduce guests to wines from China's Turpan Valley region. Chef Gagnaire will be serving up his extraordinary culinary creations until November 4. It's judgment day for Shanghai's chefs and restaurateurs. See who snagged those coveted stars in the 2019 Shanghai Michelin Guide. The 2019 Michelin Guide Shanghai results are out and these five (anonymous) chefs have some opinions. WARNING: this post may contain expletives.